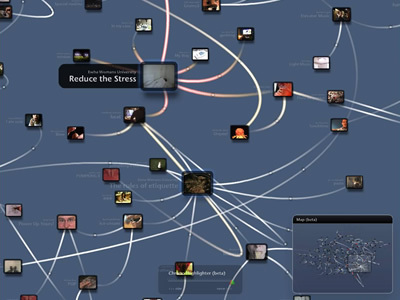 RISD.tv hosts an online laboratory for pedagogical experimentation and research into the possibilities of non-linear, networked video production. The site utilizes Lepton, a set of video collaboration tools developed by the Lepton Group, composed of Dennis Hlynksy, Chuan Khoo and Daniel Peltz, that provide the means to create and visualize non-linear works in which the interconnections of submissions are obvious and emphasized. The visualization and tracking of how ideas are associated across and within cultures of media makers is the focus of their initial explorations. RISD.tv provides a framework for dialogue through web-based video production, where people can communicate through 30-second videos and create a new note to respond to someone's video. Using video as a language establishes a means for cross-cultural, multinational dialogue that does not depend on common spoken or written languages. 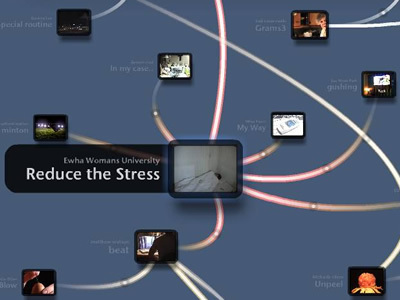 The images shown here feature the third installment of the Call and Response video dialogue project. It includes participants at the Rhode Island School of Design in the U.S., Ewha Womans University in Korea, University of Yaounde I in Cameroon and Ecole des Beaux-arts de Valenciennes in France. It is also the first series to be constructed with the new Lepton interface and video collaboration tools.